Abstract Background: ÄNp63á is an epithelial progenitor cell marker that maintains epidermal stem cell self-renewal capacity.Previous studies revealed that UV-damage induced p53 phosphorylation is confined to ÄNp63á-positive cells in the basal layer of human epithelium. Results: We now report that phosphorylation of the p53 tumour suppressor is positively regulated by ÄNp63á in immortalised human keratinocytes. 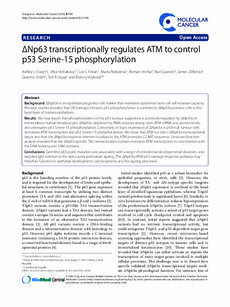 ÄNp63á depletion by RNAi reduces steady-state ATM mRNA and protein levels, and attenuates p53 Serine-15 phosphorylation. Conversely, ectopic expression of ÄNp63á in p63-null tumour cells stimulates ATM transcription and p53 Serine-15 phosphorylation. We show that ATM is a direct ÄNp63á transcriptional target and that the ÄNp63á response element localizes to the ATM promoter CCAAT sequence. Structure-function analysis revealed that the ÄNp63-specific TA2 transactivation domain mediates ATM transcription in coordination with the DNA binding and SAM domains. Conclusions: Germline p63 point mutations are associated with a range of ectodermal developmental disorders, and targeted p63 deletion in the skin causes premature ageing. The ÄNp63á-ATM-p53 damage-response pathway may therefore function in epithelial development, carcinogenesis and the ageing processes.